If you spend any amount of time in the south of Spain, you’re bound to come across some monuments that are essentially castles but aren’t actually called castillos in Spanish. Instead, they’ve got some exotic-sounding name that begins with al-, like “alcalá,” “alcazaba,” and “alcázar.” Why not just stick with the native word for castle—castillo—and leave it at that? Well, during the Middle Ages, Arabic-speaking Muslims from North Africa ruled much of the Iberian Peninsula and countless Arabic words entered the Spanish language, words like algodón (“cotton”), albañil (“construction worker”), and aceituna (“olive”). In addition to leaving a healthy amount of words in modern-day Spanish, the Arabic language also left lots of place-names across the country. Because of this, many castles you’ll run into around Spain will be called by their Arabic-derived term, usually because they are Moorish in origin or were built on an original Muslim fortification. Below I have tried to demystify these very similar-sounding words, shown you how to pronounce them, and given a handful of examples each. Enjoy! Some examples: Perhaps the most famous example is the old university town of Alcalá de Henares, just outside of Madrid, which still has the crumbling ruins of an old Arab fort outside the city. 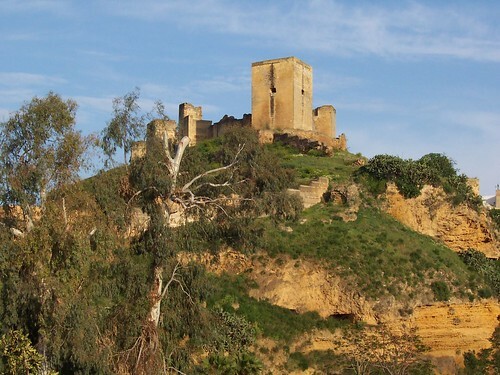 Other cities include Alcalá de Guadaíra outside of Sevilla (castle ruins pictured) and Alcalá la Real in my own Jaén province. Where it comes from: Alcazaba comes from the Arabic al-qasabah (think “kasbah”), which refers to a fortified compound within a city used by the military; i.e., a citadel. Some examples: Most visitors to Spain are familiar with the Alhambra complex on a hill in Granada. One of the oldest areas in the Alhambra is called the alcazaba, and was where soldiers kept watch and arms were stored. Other cities across the southern half of the country have their own alcazabas, including Almería, Antequera, and Mérida. How to say it: “ahl-KAH-thahr” [alˈka.θaɾ] and note that the plural is alcázares and pronounced “ahl-KAH-thah-rays” [alˈka.θa.ɾes]. Where it comes from: This one is rather fun, because it ultimately derives from Latin but gets there via Arabic. The Arabic word it comes from is al-qasr—meaning castle or palace—which itself comes from Latin castrum. Think of this less as a military fortification and more as a royal residence or fortress, although alcázar would not exclude an armed presence. Some examples: Important alcázares in Spain include ones in Córdoba, Segovia, Sevilla, and Toledo. While Spaniards will use these words in contemporary Spanish to refer to historical places, buildings, and sites, they will most likely never use them to refer to, say, the Neuschwanstein castle in Germany or the palace of Versailles. The native Spanish equivalent for alcalá is castillo, the counterpart for alcazaba is ciudadela, and the normal word for alcázar is palacio. The Arabic-derived words are almost exclusively used for said buildings or complexes with Moorish origins, while Christian castles, forts, and palaces will use the Latinate ones instead. Does this post help clear up the confusion for my non-Arabic-speaking readers? Or are you just as confused as I was before I sat down to write? Comment below!